One walk worth taking leads from Kastellaun over the village of Bell and along Wohnroth Stream to the ruins of Castle Balduinseck, which lies hidden in a deeply cut, narrow valley. This mighty edifice was erected in the year 1325 by Archbishop Balduin of Trier as a border defence against the County of Sponheim. Rauschenburg Castle, (dated 1332) a few kilometres further north near Mermuth above the Ehrbachklamm Gorge, had a similar function. 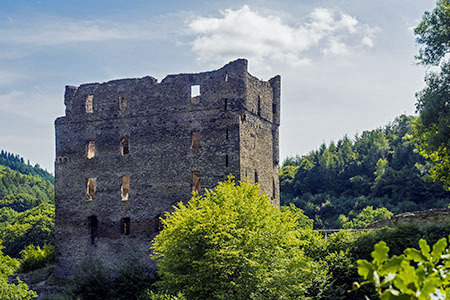 Unlike most castles in the region, Balduinseck was never destroyed by enemy troops, but rather became dilapidated over time, after which it no longer had any function and was abandoned. Consequently, it is still possible for visitors to understand something about the home comforts of that time. In fact, the palace, with lateral lengths of 22 and 14 meters, has remarkable proportions, with several floors that were conveniently reached by a spiral staircase. Smoothly plastered walls, as well as fireplaces on all floors, provided a comfortable ambiance in the boudoirs. On the other hand, the mighty outer walls also allowed for a strong defence. Another rewarding excursion leads into the village of Neuerkirch, which is on the road to Simmern. The old village centre here has been lovingly restored through a renovation program. The museum of culture very graphically displays the traditional Hunsrück crafts along with their tools. Among others, you can see a baker, beekeeper, carpenter, roofer, basket maker, blacksmith, and cobbler. Also on display are the typical agricultural implements of the region, allowing you to gain an insight into the rural style of life.